I love taking pictures but I'm a picture-printing-procrastinator. I've bought several Groupons for photo books -- they've expired. 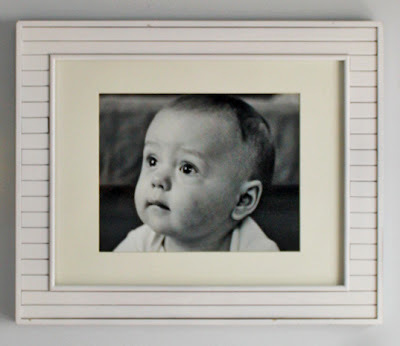 I have picture frames on display in our house -- they're filled with models and their model children. I am allergic to printing pictures. If it weren't for my mom begging me to print her some pictures of the boys I probably would have left all these frames blank for at least a year or two... or until we moved, at which point I would've convinced myself it was a smart idea to leave them empty because it helps when the potential buyer can envision their own family in the house. Just bein' smart. 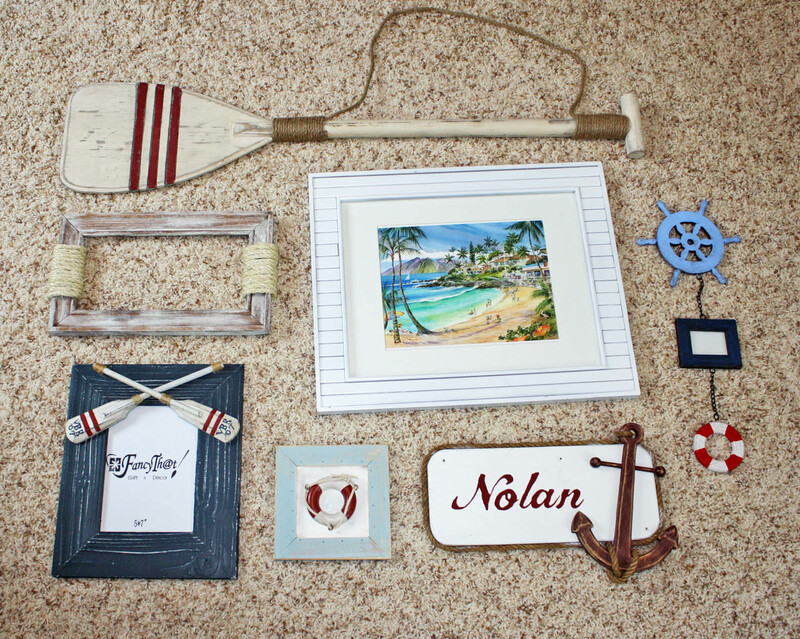 Last summer I started collecting nautical-themed items for N's room. The first was this Welcome sign that I re-painted using this technique. I decided not to distress it because several other pieces for the wall were distressed and I wanted it to be a mix of clean and weathered. I found this piece of artwork (along with 2 others) at a garage sale. I already had so many anchors/oars/etc. so I yanked the rope and life preserver off and just painted it red and did some light distressing. Although I wish I could say the oar was an amazing garage sale find, sadly, it was not. Although, it was a pretty great Home Goods find considering it was the only one they had and it was buried under a bunch of broken junk in the clearance aisle. Certainly not placed there by accident. I am all too familiar with that move. Nice try fellow oar-wanter, but you can't hide stuff from me! The oar was $14.99 and originally had turquoise stripes, but I repainted them red. This large white frame (with this cute chubby-cheek babes) was a brown wooden frame that I just painted white. And that chincy wheel-frame-presever chain thing is just what it looks like. I needed something for the right side that was tall and skinny and this was all I could come up with. Boo. Need to find a replacement for it. Step 1: Lay out your design on the floor. Step 2: Measure the layout and determine if it will fit in the space on your wall. Step 4: Trace all your pieces on newspaper (*see tip below about this), cut out the shapes, and arrange on your wall. This idea courtesy of Before Meets After (found on Pinterest). Step 5: Hang pictures. I used 3M Command Strips when possible. Step 6 (the hardest step): Get pictures printed. Step 7 (also a hard step): Place pictures in frames. Pretty happy with the results. I think one more oar along the bottom, flipped the opposite way would make it perfect (oh, and finding a replacement for the chain-o-nautical-stuff). 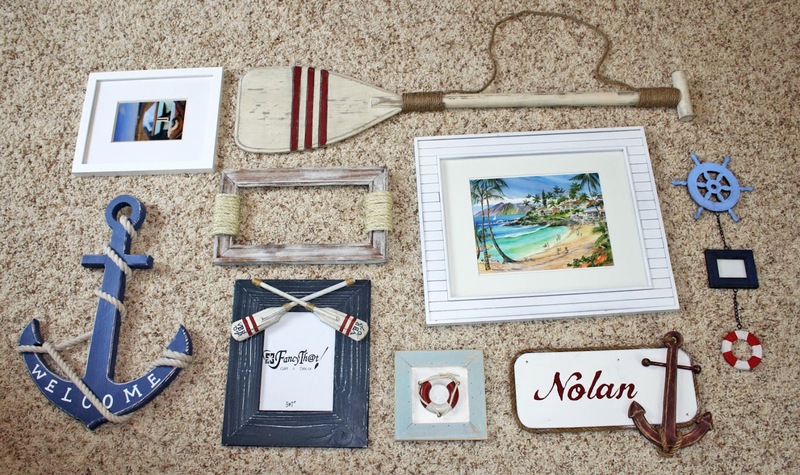 I'll need to head back to Home Goods and see if the oar-wanter has any new hiding places. Such a darling wall. It really turned out cute. I especially love how you personalized the sign. Ohh This is really cute, very special and looks awesome, he'll enjoy being there. Nice! I like the frame with the white wash and rope. Lovely! Real canoe paddles are cheap! Paint them yourself! 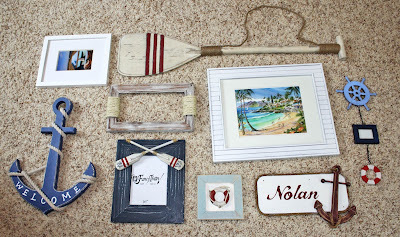 Frames on my oar wall are still empty too! 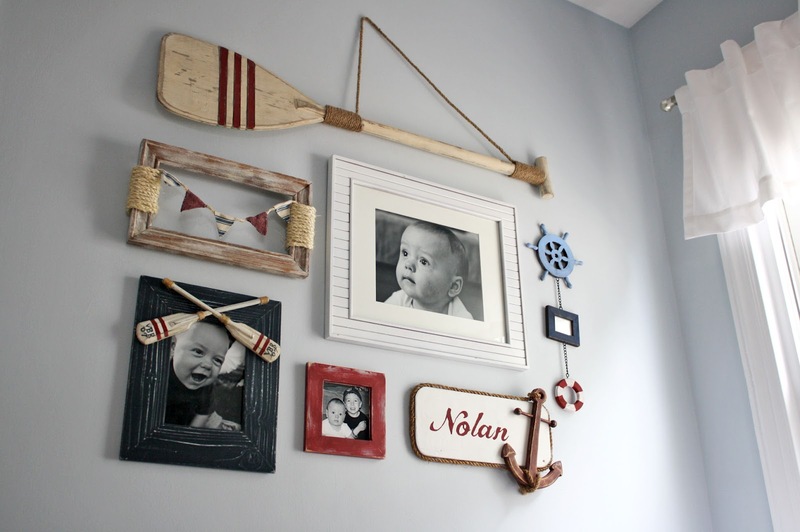 You have an oar wall??? Oh I'd love to see it! Love the font you used for your son's name. Where did you get the stencil from? The font I used was a free download called "The Dreamer." I've used it on a few things and really love it! I love your gallery wall! The items you used are great and I love how you made them your own. You did a super job! 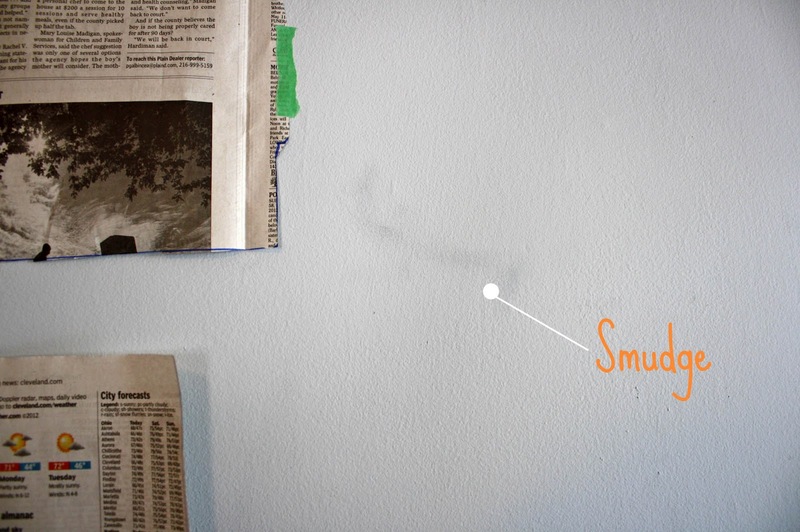 Great reminder about the newspaper trick as well- I always forget to do that and end up with lots of holes in my drywall, haha. Congrats on being feature awarded from Random Thoughts from an Incoherent Mind! Visiting from Random Thoughts and wanted to say how cute I thought your nautical wall collage is! You did a great job with all the details and it really shows! Beautiful Katie! Congrats on being newbie spotlight of the week. Gina picked a great one this week. Thanks for sharing with the newbie party too. 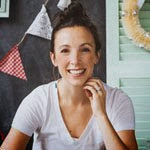 Hi Katie, I just saw you featured over at Gina's. 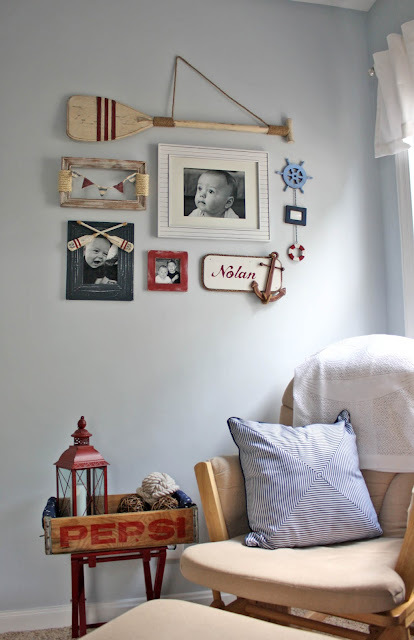 LOVE LOVE your nautical wall!!! 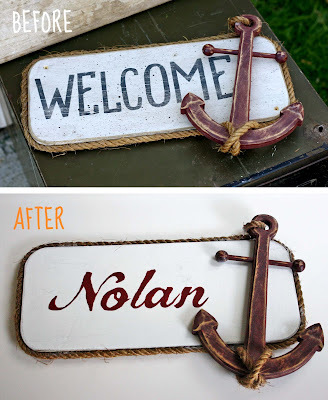 My favorite is how you transformed that little welcome sign with his name! Totally adorable! Just perfect for a little boy's room. I stopped by from Gina's and so glad I did. Congrats on being featured this week! Looks great, you are very talented! models pics that were in the frames! I read about your blog over at my sweet friend Gina's blog. 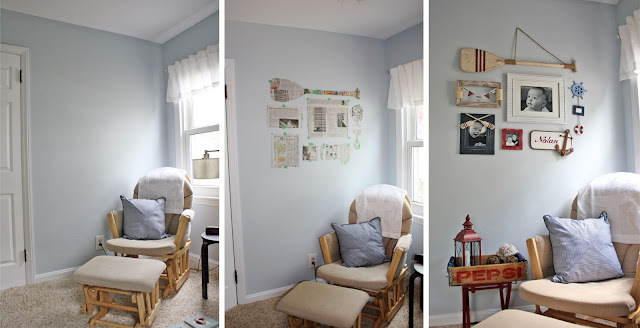 Just had to stop by and tell you that I loved, love, love your gallery wall. 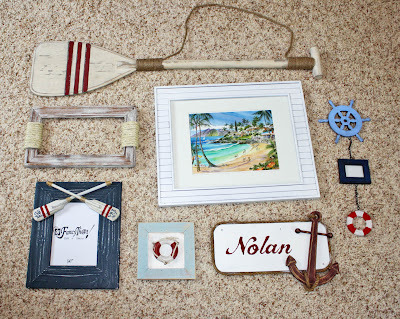 All the nautical elements are perfect. Great job. It was nice meeting you. Have a wonderful day. 3 Tier Table - Done-zo!